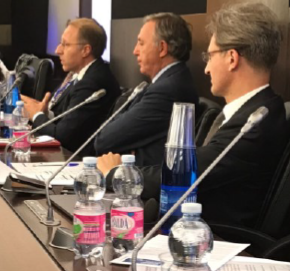 GLMS President, Ludovico Calvi, attended on September 27-28 the international conference on "PROTECTED REPORTING SYSTEMS, organised in Rome by the office of sport of the Council of Ministers Presidency. The conference was the conclusive event of the anti match-fixing formula (AMFF) project, which was co-financed by the European Commission. Intervening on both days, GLMS President, urged for the quick entry into force of the Council of Europe Convention on the Manipulations of Sport Compétitions (Macolin Convention) and also highlighted the importance of the Macolin RoadMapm and the Copenhagen Group (the informal network of na-tional platforms coordinated by the CoE). Ludovico Calvi also presented the GLMS structure and its wide membership, which includes operators from all over the globe, including Asian operators and its methodology. On the 2nd day, which was even more operational, Ludovico had also the chance to present some success stories of the GLMS.